With about 1,40,000 automated teller machines (ATMs) in the country, and the number rising about 28 per cent a year, India remains one of the most under-penetrated ATM markets. 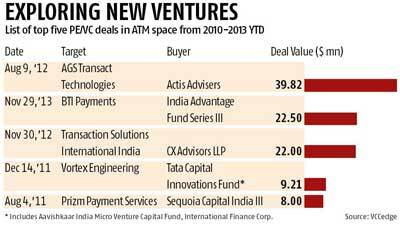 This, coupled with the Reserve Bank of India (RBI)’s move to allow third-party white-label ATMs, has made the sector attractive to India-focused private equity (PE)/venture capital (VC) funds and strategic investors. The central bank’s plan to issue more banking licences has added to the draw of this space. Recently, Japanese technology giant Hitachi acquired Chennai-based Prizm Payment. The five-year old Prizm, backed by Sequoia Capital, has deployed 10,000 ATMs—under management and maintenance—and about 52,400 point-of-sale (PoS) devices under management. It is learnt Sequoia’s returns have been five times its $15-20 million investment. 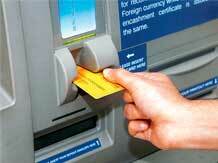 As part of cutting increasing costs, banks are outsourcing the management of ATMs to third-party service providers. Last year, Private equity firm Actis, had invested about Rs 200 crore in AGS Transact Technologies, which runs and manages ATMs. In June 2012, RBI had announced the guidelines to introduce white-label ATMs, with an aim to expand banking services in rural and semi-rural areas. These ATMs are owned and operated by non-banking financial companies and do not display any bank’s logo. India, there are only 98 ATMs for every 10,00,000 people; while China has 211, the US has about 1,400. The Rs 500-crore Prizm Payments plans to set up 10,000-15,000 white-label ATMs in the next two years, while BTI Payments plans to roll out about 10,000 such ATMs through the next four years. RBI has given a white-label ATM licence to Tata Communications Payment Solutions Ltd, which will deploy 15,000 such ATMs in the country through the next three years. “Banks with less ATMs are scared their customers will be lured by other banks providing additional services through ATMs. Implementing more white-label ATMs can be a solution; consumers can use the same facilities across the country,” said a PE investor. In the last three years, India’s ATM sector has seen PE investments worth $118 million, through nine transactions. In 2009, Financial Software & Systems, a Chennai-based electronic payments processing firm, had raised $60 million from PE firms Jacob Ballas Capital India Pvt Ltd and New Enterprise Associates Inc, offering an exit for Carlyle, which had invested $10 million. According to reports, Financial Software & Systems is in talks with PEs to raise an additional Rs 200 crore to carry out its expansion plans. Mumbai-based Accura Infotech Pvt Ltd, which installs ATMs, is reportedly in talks with PE investors to raise Rs 125 crore by selling minority stake.